Especially at high speeds, motorists focus most of their attention down the middle of the roadway, not along roadway edges. Bicyclists ride double file and in the middle of the lane to be more visible to motorists. Bicyclists are legally permitted to use the full travel lane – it’s in the NC Driver Handbook (see Chapter 6). 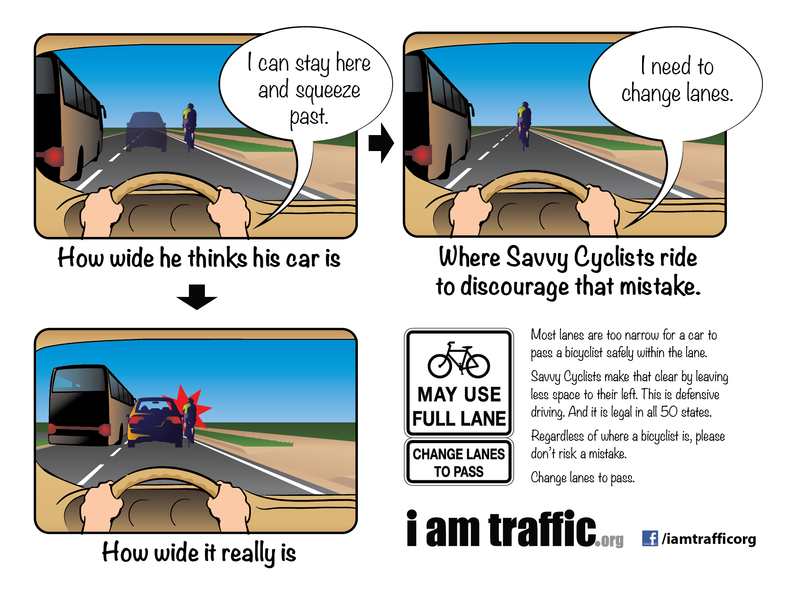 Motorists should Change Lanes to Pass Bicyclists – there is rarely enough room to pass within the same lane. Bicyclists avoid bike lanes that are unsafe – too narrow, filled with debris, near parked cars – or not going in the direction they wish to travel. Riding on sidewalks is dangerous for bicyclists and pedestrians and unlawful in some places. Take your foot off the gas, then change lanes to pass. Why are you riding in the middle of the lane instead of way over on the right? Why are you riding double file taking up the whole lane? But aren’t you supposed to share the road, like the sign says? Why aren’t you riding in the bike lane? I just passed that bicyclist – why has s/he squeezed past me at this red light? Why don’t you ride on the sidewalk? Why do some cyclists wear those tight-fitting clothes? Bicyclists ride in the middle of the lane to be more visible. As with any slow-moving vehicle, motorists should slow down, wait until it is safe, and Change Lanes to Pass Bicyclists. In North Carolina, bicyclists are allowed to use the full lane. 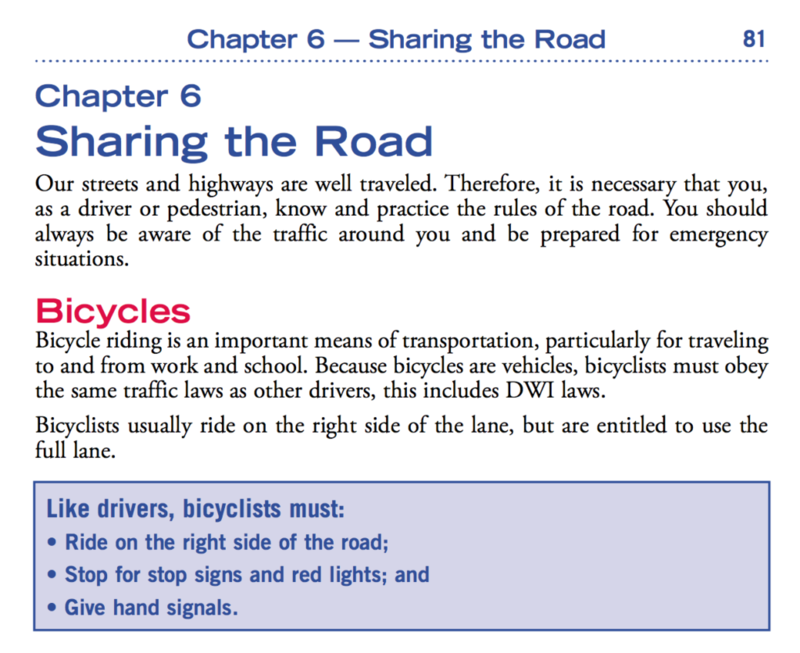 North Carolina’s Driver Handbook explains it most clearly (Chapter 6, Page 81): Bicyclists usually ride on the right side of the lane, but are entitled to use the full lane. 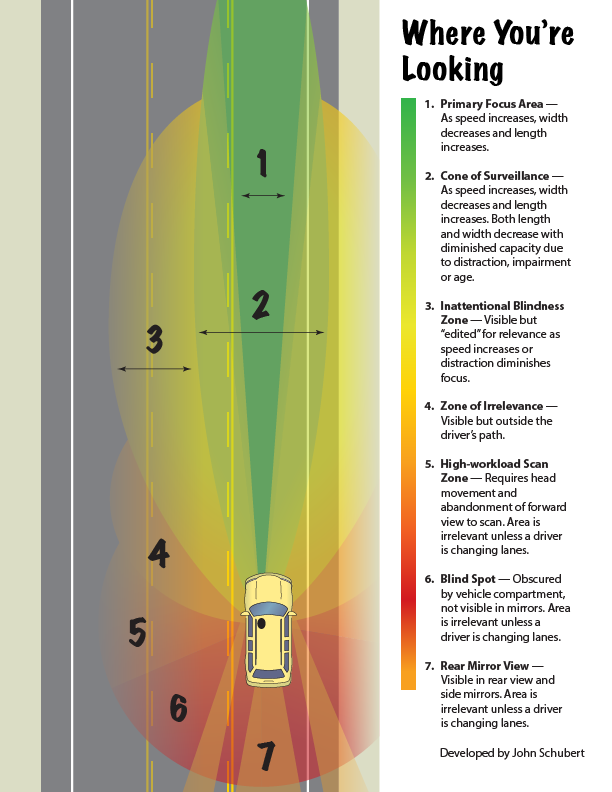 When driving motor vehicles, people don’t do the best job scanning the edges of roadways; particularly as they go faster, they tend to focus on what’s right in front of them. Knowledgeable bicyclists know this and prefer to ride where motorists look rather than blending with the visual clutter at the edges of the roadway. 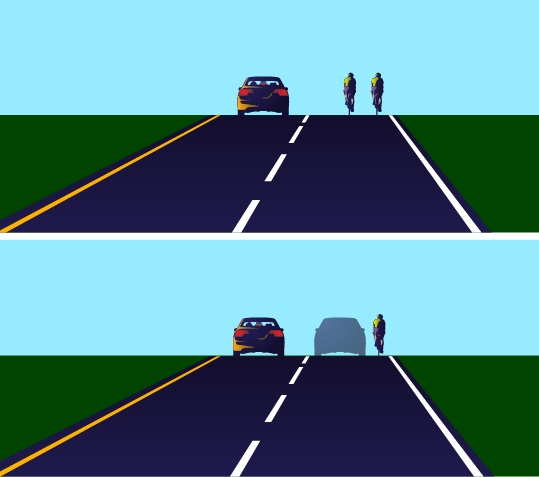 Particularly on narrow, high-speed, rural roadways, a bicyclist riding to the far right increases the chance that a motorist approaching from behind will not see the bicyclist, or that the motorist will misjudge lane width and try to squeeze past without changing lanes, realizing too late that there is inadequate space to do so. By riding in the middle of the lane, bicyclists signal to motorists they will need to Change Lanes to Pass or slow down and wait until they can. Motorists will think twice before trying to pass on curves or near hill crests where they can’t see far enough ahead to ensure a safe pass. Bicyclists avoid the squeeze play by riding in a central position. Image: Keri Caffrey. 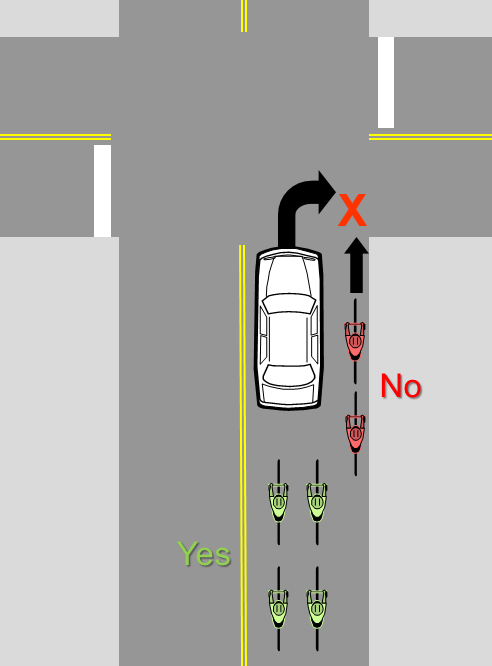 There is not enough room to pass even a single bicyclist on most roads without moving into the adjacent lane. Riding double file does not change that, but increases our visibility and shortens the distance needed to pass us, if we are in a group. A group of bicyclists riding two abreast on a narrow, shoulderless roadway. It is easier for motorists to see bicyclists riding in this manner and obvious that they must Change Lanes to Pass. Photo: Jeff Viscount. 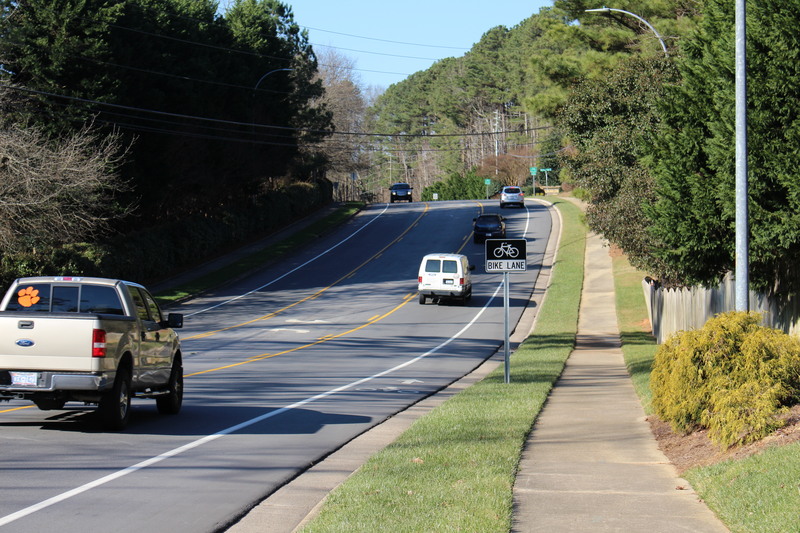 Most collisions on the narrow, shoulderless, rural roads so common in North Carolina occur when motorists attempt to squeeze past bicyclists riding on the right edge of the roadway. Riding double file on these roads is a common practice. It is a lawful, defensive bicycling technique taught by all adult bicycle safety organizations. It is so safe, in fact, that there are no known instances of bicyclists riding double file being hit from behind by motor vehicles in North Carolina, or indeed nation-wide. Riding two abreast increases visibility of bicyclists and helps deter unsafe same-lane passing. Image: Keri Caffrey. When there are more than just two of us, riding double file cuts the required passing distance in half when compared to a line of single file riders. We try to keep groups no larger than a tractor trailer to facilitate passing by motorists. When encountering any slow-moving vehicle, motorists should slow down, wait until it is safe, and Change Lanes to Pass. The Share the Road sign is intended to let motorists know to expect and respect bicyclists in the roadway, not to tell bicyclists to get out of the way. In other words, “Share the Road” is directed primarily at motorists. Traffic engineers and bicyclists have long questioned the value of the sign, because the message is so ambiguous. Delaware discontinued use of “Share the Road” in 2013 and Oregon did so in 2016 for that reason. Knowledgeable and courteous bicyclists take a cooperative interpretation of the sign as asking motorists and bicyclists to work together so that they can each get down the road as safely and quickly as possible—with the emphasis on safely. These bicyclists will do what they can to help motorists get past them, so long as there’s a safe way to do that. “Share the Road” is also not the same as “Share the Lane.” Bicyclists concerned about safety will often not ride to the far right in lanes narrower than 14-feet. Even in the face of oncoming traffic, motorists may think they can pass bicyclists riding on the far right within the same lane. In most instances there is not enough room and it’s just too easy for something to go wrong, with the bicyclist on the losing end. When encountering any slow-moving vehicle, motorists should slow down, wait until it is safe, and Change Lanes to Pass Bicyclists. Bicyclists will often avoid using bike lanes that are not safe and will leave bike lanes to enter appropriate travel lanes for making turns. 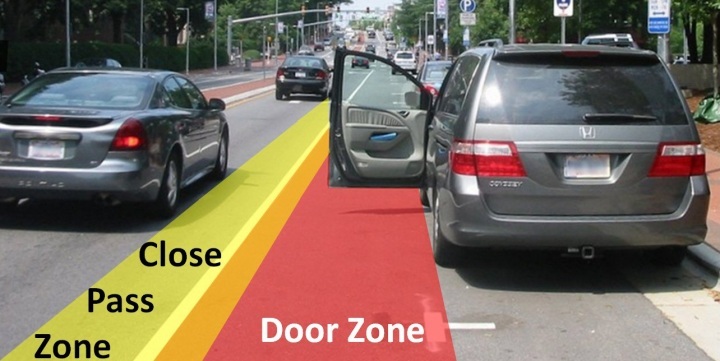 Well-designed bike lanes are spacious to avoid forcing bicyclists into positions close to motor vehicle traffic, opening doors of parked vehicles, and roadway edges. They must also be swept fairly frequently as debris collects in them because there’s no motor vehicle traffic to blow it away. Well-designed bike lane. This wide bike lane leaves plenty of room for maneuvering. 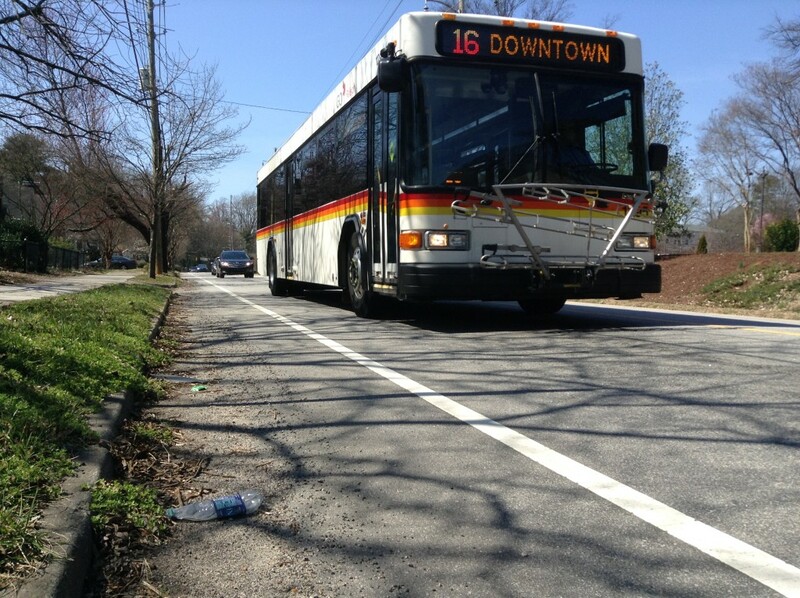 The general purpose travel lane is also wide and can accommodate bus and truck traffic while still leaving plenty of clearance between motorist and bicyclist traffic. Lake Pine Drive, Cary, NC. Photo: Steven Goodridge. Unfortunately, many bike lanes are poorly designed and maintained with the sole purpose of getting bicyclists out of the way of motorists, without regard to whether they are actually safer for bicyclists. Bike lanes frequently create dangerous conflicts at intersections – by placing straight-through bicyclists to the right of turning motorists, for example – placing bicyclists in harm’s way. The use of bike lanes is not mandatory in North Carolina and knowledgeable bicyclists will leave bike lanes that place them in hazardous situations. Poorly designed bike lane. The bike lane is narrow, right next to parked cars, and adjacent to a narrow travel lane used by buses and trucks. It is a dangerous place to ride and many bicyclists will abandon it and use the main travel lane. Hillsborough Street, Raleigh, NC. Photo: Steven Goodridge. Poorly designed and maintained bike lane. This debris-filled bike lane is 4-feet wide with barely 12 inches of usable road surface just right of the white line, squeezing bicyclists up against traffic that includes wide buses. Peace Street, Raleigh, NC. Photo: George Hess. Bicyclists planning to turn will also merge into adjacent lanes from straight-through bike lanes when approaching intersections. This is certainly the case for left turns and, depending on the configuration of the bike lanes, a bicyclists may leave the bike lane to merge into a right-turn-only lane before turning right. Bicyclists should not do this. It is unlawful, unsafe, rude, and a major irritant among motorists. In the bicycling community we are doing our best to spread the word that this practice must stop. Bicyclists should queue up in traffic and wait like everyone else. Bicyclist should not move up on the right of motorists at intersections. They should queue behind the motor vehicles. Image: Steven Goodridge. Passing stopped traffic on the right is lawful is if there is a bicycle lane, in which case bicyclists may ride to the intersection in the bike lane. But bicyclists should do this with extreme care because motorists might not notice that they have moved adjacent to them and make an unexpected right turn. This is just one of the many hazards bike lanes create for bicyclists. Riding on sidewalks is dangerous for bicyclists and pedestrians, and is illegal in some locations. Studies show that crash rates are much higher for bicyclists who ride on sidewalks compared to bicyclists who ride on the adjacent roadways. Sidewalk bicycling is a contributing factor in the most common types of motor vehicle–bicycle crashes in urban and suburban areas, where drivers cross the paths of sidewalks and crosswalks without seeing or recognizing bicyclists traveling faster than walking speed. It’s very hard to maneuver on sidewalks, which are often crowded with people walking in both directions listening to music and talking on phones. Some have lots of driveway crossings, and there are perilous conflicts and blind spots at intersections. Especially in cities and towns, where sidewalks are most common and speed limits tend to be lower, roadways are a much better match than sidewalks for the speed and maneuverability of bicycles. All in all, the roadway is a better place for vehicles – including bicycles – than sidewalks designed for pedestrians. Believe it or not, they are just super-comfortable for bicycling. Many bicyclists ride in “regular clothing” for most of their rides—particularly if they are commuting to work or bicycling to the store. 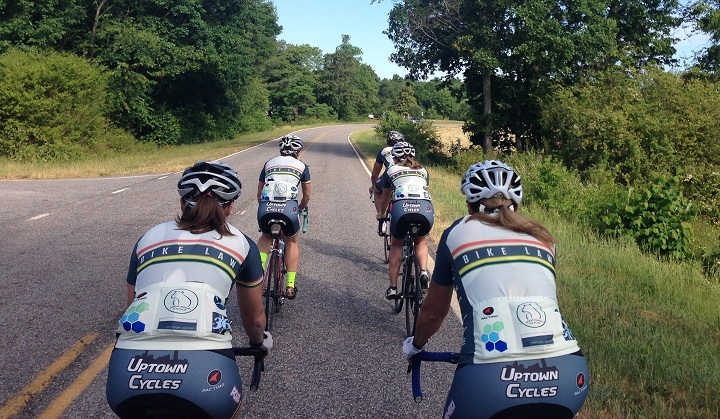 On longer rides, most bicyclists prefer bicycle-specific clothing for comfort and performance. The shorts are padded in all the right places. Shorts and jerseys (tops) fit close to the skin so that they don’t flap in the wind, which is both noisy and aerodynamically inefficient. The clothes are designed to wick moisture away from skin quickly, which helps keep us cool in summer and warm in winter. Jerseys have pockets in the rear for carrying all sorts of gear—tubes, tires, wallets, phones, food, water bottles—and are usually bright and colorful to make us more visible on roadways. Bicycling shoes are designed to clip directly to the pedals for a solid foot-bicycle connection and increased efficiency.